Great Lakes Pickling low-sodium pickles. Premium pickles, craft made in Michigan by hand. (PRLEAP.COM) Great Lakes Pickling company is pleased to announce the certification of their line of pickles as low-sodium. The low sodium pickles are 1/3 the sodium of store-bought pickles while enhancing the taste and crunch. Traditionally large amounts of salt are used as part of the brine. When asked about why Less Sodium, Beverly Patterson of Great Lakes Pickling said "It's all about flavor. We substitute salt with a blend of natural herbs and spices. This makes for a better tasting, fresh and crunchy pickle." She added "When my husband Lou was given a low-sodium diet by his doctor. Lou loves his pickles and I couldn't see him suffer without the one thing he enjoyed the most; pickles. My determination paid off with a handcrafted pickle he can enjoy.". A recent Gallup poll reported that 42% of all adults are actively trying to avoid salt in their diet. According to data compiled by Statista from the U.S. Census and Simmons National Consumer Survey, 239.17 million Americans consumed pickles in 2017, and the figure is projected to increase to 245.56 million by 2020. In America, the pickle market is expected to reach $6.70 billion by 2020. This increase is also reflected by data from Pinterest revealing that saves for pickle recipes in 2018 are up 114% year over year. The pickles can also be found at Midwestern Grocery retailers as well as on Amazon. The company is seeking additional retail distribution partners as they expand beyond the Midwest. The Granny's Dill, Garlic Dill, and Smoked Garlic and Dill are fat-free, low-sodium, low-calorie snacks. They are also 100% vegan, all natural and gluten-free. Newly handcrafted pickles are being developed and introduced in 2019 along with a number of new product lines. 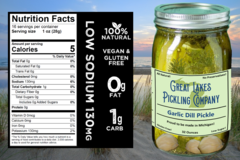 The Great Lakes Pickling Company founded in 2016, has also partnered with grocery chains, restaurants, gourmet stores, and food processors providing wholesale pickles as well as acting as a private label pickle manufacturer.